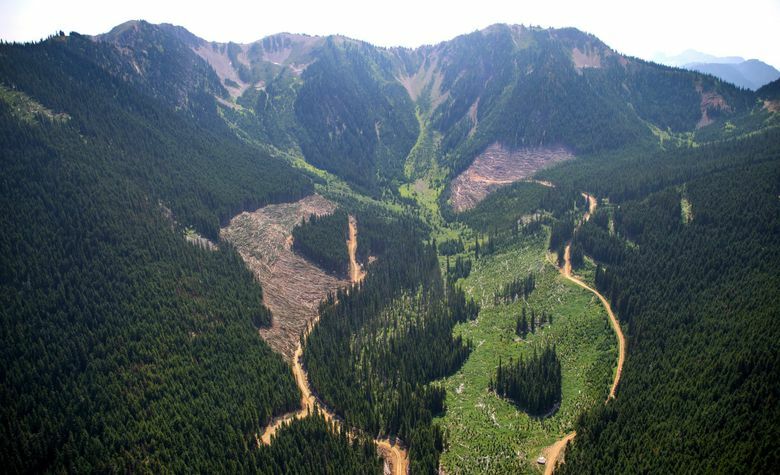 A Canadian company has applied for an exploratory mining permit in the headwaters of the Skagit River, which flows from British Columbia and through northwest Washington state to Puget Sound. The Skagit River is one of the premier salmon-producing rivers for Puget Sound, and its waters churn through hydropower dams to bring the city of Seattle much of its electricity. Its upper waters are home to endangered bull trout. To the dismay of some conservationists, crews last summer began to clear-cut trees within the donut hole at the behest of the B.C. government. Seattle Mayor Jenny Durkan wrote B.C. Premier John Horgan with “grave concern” over the issue, arguing it could harm water quality and threaten fish in Washington waters downstream. 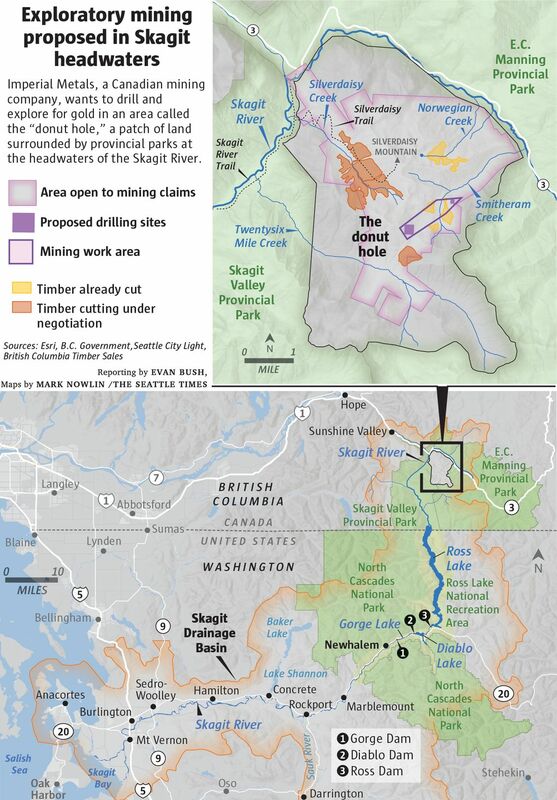 Mining, though, has been conservationists’ greatest fear, and this proposal could test a longstanding treaty between the U.S. and Canada over the Skagit River. This controversy has been simmering for decades after the city of Seattle began construction of Ross Dam, on the Skagit River, in 1937. The dam, by 1949, had created a reservoir, Ross Lake, that stretched many miles and into Canada. For decades, the city contemplated building higher and sending more water flooding across the border. B.C. activists were not keen on that plan. B.C. and Seattle came to an agreement in 1984. Seattle wouldn’t raise the dam and send more floodwaters into B.C. In exchange, the Canadians would provide Seattle inexpensive hydropower through 2065. The agreement created the Skagit Environmental Endowment Commission (SEEC), with four members appointed by Seattle’s mayor and four by the B.C. premier. The agreement mandates that SEEC work to conserve the watershed, enhance recreation and acquire lingering mining and timber rights to protect the land. A treaty, signed by U.S. and Canada, cemented the deal. The SEEC commissioners have been in talks with Imperial Metals and the B.C. government for at least a decade, said Michelle Connor, a former SEEC co-chair for the U.S., who is president and CEO of Forterra, a Seattle-based land conservancy. Four years ago, SEEC began negotiations with Imperial Metals to acquire mineral tenures, or claims. Durkan, in her letter to B.C. Premier John Horgan, said it was against the spirit of the 1984 treaty. Conservationists mostly worried that creating new roads for logging trucks would make mining more attractive. Their fears might have been warranted. In its application, Imperial Metals indicated it only had to extend a trail from a newly cut logging road to get to proposed drill sites. Metals, particularly copper, are toxic to salmon. Even low concentrations of dissolved copper in water can damage salmons’ sense of touch and smell, said Jen McIntyre, an assistant professor at Washington State University’s School of Environment. That can prevent them from finding food, evading predators or making their way to spawning ground. The possibility of a mining spill worries some conservationists. The Upper Skagit Tribe also is concerned and reviewing its options. Until recently, Imperial Metals had been hobbling financially. The company in January suspended operations at the Mount Polley mine “due to declining copper prices,” according to a news release, though environmental remediation there continued. In February, it extended several lines of credit that were coming due for payment. Earlier this month, the company got a boost. An Australian company, Newcrest Mining, spent just under $807 million to purchase a 70 percent stake in Imperial Metals’ Red Chris mine, which is some 160 miles east of Juneau, Alaska. In a brief interview Thursday, Imperial Metals CEO Brian Kynoch said the company needed to explore to see where its donut hole holdings fit into overall plans. Exploratory drilling could provide leverage in negotiations with SEEC, or represent the beginning of the process to site a mine. He said Imperial, and other mining companies, frequently and broadly test. “If you have a geologic concept that you can test cheaply, you do it,” Rule said. The probability of uncovering something that would be valuable enough to mine, he said, is low. Representatives of the B.C. government surprised Seattle officials last week when they called to explain that a mining application had been filed. After Durkan’s protest over logging last summer, the B.C. government put on hold the auction of logging rights within the donut hole. In February, Durkan and Premier Horgan held a telephone conference about the issue. City officials said Horgan had not mentioned that a mining application had been submitted. The date listed on the Imperial Metals application is Dec. 19, 2018. The B.C. Ministry of Energy, Mines and Petroleum Resources declined to make anyone available for an interview. The mining application will be open to comment for a month. During that time, First Nations, government agencies and community groups can object or remark upon the application. Then, a technical review will be completed. “Historically, these permits just fly,” said Calvin Sanborn, legal director at the University of Victoria’s Environmental Law Centre. The 1984 treaty could provide some leverage to Seattle in opposing the mining project. The agreement outlines a dispute-resolution process that city officials and SEEC commissioners have been reviewing. Durkan said in her statement the city would submit a response over the impact of mining and would evaluate the city’s options under the treaty. Correction: An earlier version of this story misspelled the first name of Imperial Metals’ CEO Brian Kynoch.